Crown molding has a way of adding elegance to just about any room. Although it can appear massive, it's really an illusion that comes from spanning the ceiling wall joint with a strip of decorative wood set on an angle. One of the trickiest things about crown molding is cutting the correct angles at the corners. Each corner requires two angles — a miter angle which is cut across the face of the molding [SAWING SOUNDS] and a bevel angle that's formed across the end or edge. When working with crown molding, both of these angles have to be made at the same time and that's why they're called compound angles. Accuracy is critical. An error of even one degree or less can result in an ill-fitting joint. The tool to make this cut is the power miter saw. One way to make a combination miter is by cutting the molding while it's held on an angle. 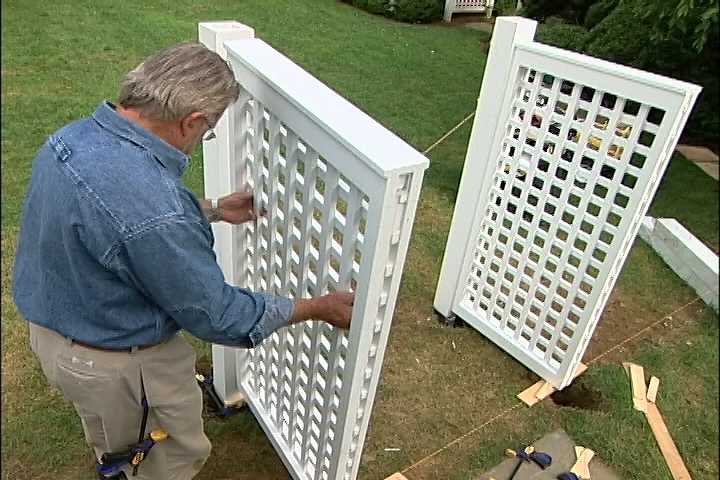 When using this technique though, it's important to make sure the back surfaces of the molding are fully in contact with the fence and saw bed. 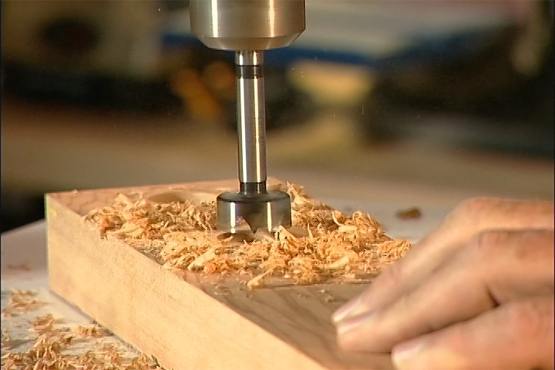 While you can't hand hold the molding in place, there's always the chance the work piece can move during cutting. Some saws like this DeWalt model have available as an accessory, these adjustable crown molding stops. Another way to make certain the molding does not shift while being cut is to make a simple wooden jig to hold it firmly in place. A jig can be easily made by attaching together, two pieces of half-inch plywood, making certain that they form an accurate right angle. After the glue is dry, the jig is set in place on the miter saw bed and attached with screws inserted through predrilled holes in the metal fence. With the jig secured, cuts are made at 45 degrees — and zero degrees. [SAWING SOUNDS] Then a sample piece of molding is set into the jig, a wooden stop is in place next to the edge and stapled in place. 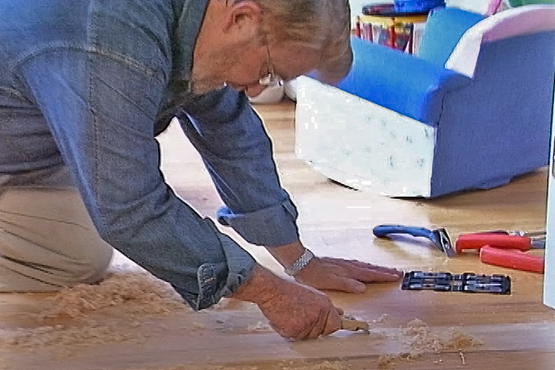 No glue should be used here since the stop would need to be relocated if a different sized molding were being cut. The jig holds the crown securely in just the right position each time a cut is made. No adjusting, no slipping. What does have to be adjusted though is the swing on the miter saw. That's because even though they may look square, many wall corners do not form perfect 90-degree angles. So each corner needs to be measured individually and that measurement must be accurate to get a tight-fitting miter. Now the old way of doing this was to take a bevel gauge, adjust it to fit the corner, lay the bevel gauge on top of a protractor, read the angle on the protractor and then divide that reading by two. That provided the miter saw setting. Well, fortunately there's a much faster, simpler and more accurate way. This 505P protractor from Starrett Tools is designed just for this job. Place it in the corner and open the wings until they come into contact with the wall. Now — and this is the slick part, simply read the miter saw setting directly from the tool. No calculating, no transferring measurements and practically no chance for error. Now there are two types of crown miter joints — inside corners and outside corners. Here are the steps for making each. 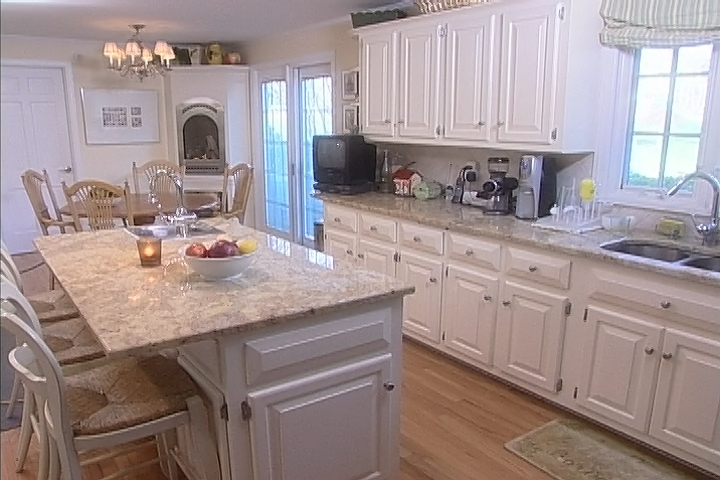 In most cases, the crown molding bottom is the edge that has the most detail. One thing is common to both inside and outside corners and that is the molding must be placed into the saw with the bottom edge up. In other words, the bottom edge will always be against the miter saw fence. It's also important to keep in mind whether you're cutting the left hand or right hand piece of molding, okay? Here we go. When cutting the left hand piece of an inside corner, swing the miter arm to the right and place the work piece on the right side of the blade. To cut the right hand section of an inside corner, swing the miter arm to the left and place the work piece to the left of the blade. I know this can seem complicated but don't worry about taking notes. You can download a simple table directly from Starrett Tools by going to featured.starrett.com/crown. Here's how to handle an outside corner. Measure the corner angle using the Starrett 505P protractor. Read the saw setting and set the miter saw arm. When cutting the left hand piece of an outside corner, the miter saw arm should be swung to the left and place the work piece on the right side of the blade. 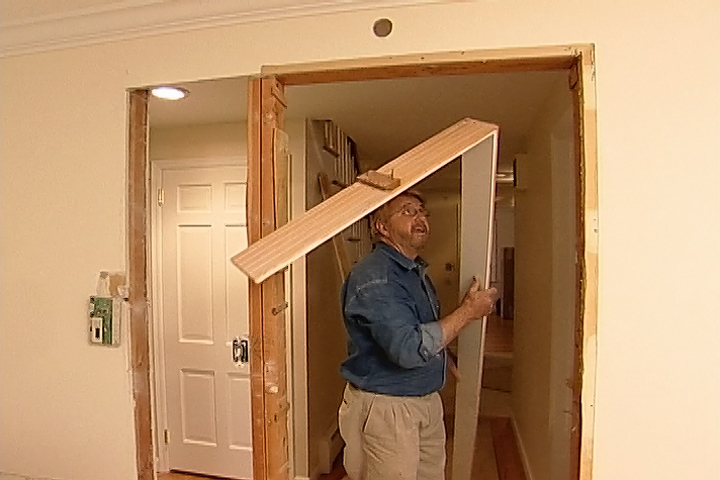 Whenever possible, nail the crown molding into wall studs and ceiling joists. 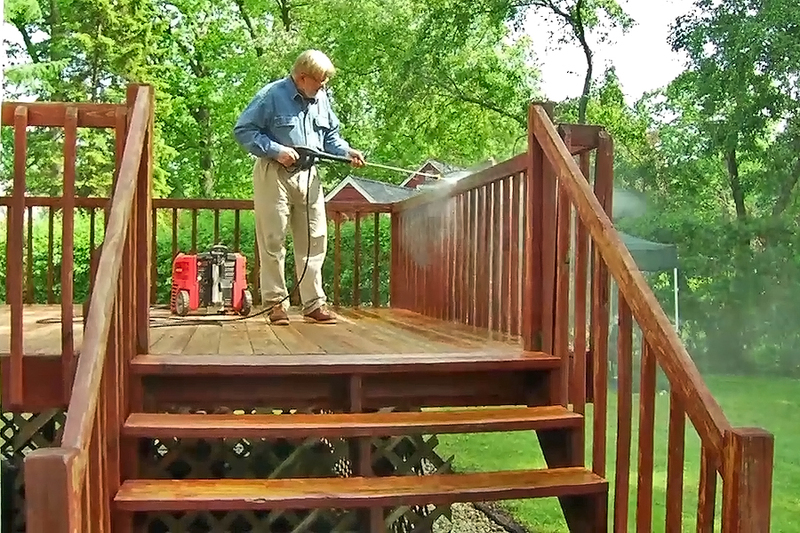 A pneumatic nail gun will save a lot of time and avoid the possibility of damage resulting from missed hammer blows. No question about it, crown molding, properly installed is a beautiful thing. Figuring out the miter saw settings for cutting compound angles on crown molding has typically been a multi-step process and required a fair amount of math. A combination protractor like the one demonstrated here makes the job faster and simpler and eliminates any need for arithmetic. The tool displays the miter saw angle setting directly without the need to calculate. 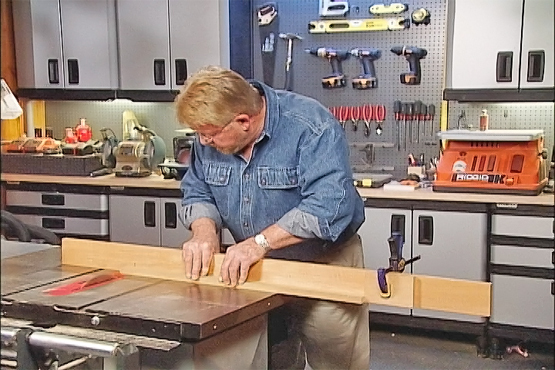 The cutting method used in this video calls for the crown molding to be set on an angle in the saw bed. The demonstration shows in detail how to place the material in the saw and what the position of the workpiece should be relative to the blade. The combination protractor used in this video article is available from Amazon. Click here for more information. Crown molding corners require a miter angle and a bevel angle. Making a combination miter cut by holding the molding on an angle. Make a cut at 45 degrees — and zero degrees. Each crown molding corner requires two angles — a miter angle which is cut across the face of the molding and a bevel angle that's formed across the end or edge. When working with crown molding, both of these angles have to be made at the same time and that's why they're called compound angles. Accuracy is critical. The tool to make this cut is the power miter saw. One way to make a combination miter is by cutting the molding while it's held on an angle. 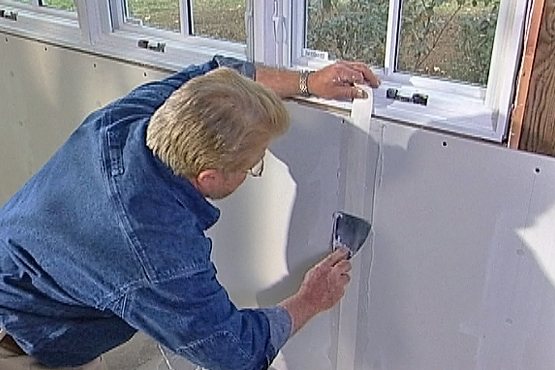 When using this technique, make sure the back surfaces of the molding are fully in contact with the fence and saw bed. Some saws have an adjustable crown molding stop accessory. You can make a jig by attaching together two pieces of half-inch plywood using glue and making certain that they form an accurate right angle. After the glue is dry, the jig is set in place on the miter saw bed and attached with screws inserted through pre-drilled holes in the metal fence. 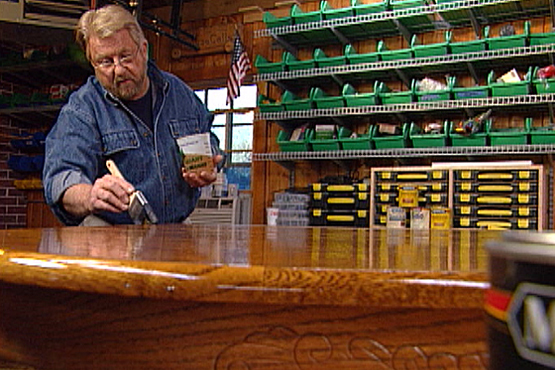 Place a sample piece of molding into the jig and place a wooden stop next to the edge and staple it in place. Do not use glue as the stop needs to be relocated if a different sized molding is to be cut. The jig holds the crown securely in just the right position each time a cut is made. Each corner needs to be measured individually and that measurement must be accurate to get a tight-fitting miter. Using a bevel gauge, adjust it to fit the corner and then lay the bevel gauge on top of a protractor. Read the angle on the protractor and then divide that reading by two. That provides your miter saw setting. Using the 505P protractor from Starrett Tools, place it in the corner and open the wings until they come into contact with the wall. Now read the miter saw setting directly from the tool. In most cases, the crown molding bottom is the edge that has the most detail. Both inside and outside corner moldings must be placed into the saw with the bottom edge up. The bottom edge will always be against the miter saw fence. When cutting the left hand piece of an inside corner, swing the miter arm to the right and place the work piece on the right side of the blade. To cut the right hand section of an inside corner, swing the miter arm to the left and place the work piece to the left of the blade. Measure the corner angle using the Starrett 505P protractor. Read the saw setting and set the miter saw arm. When cutting the left hand piece of an outside corner, the miter saw arm should be swung to the left and place the work piece on the right side of the blade. When cutting the right hand section of an outside corner, swing the miter arm to the right and place the work piece to the left of the blade. Whenever possible, nail the crown molding into wall studs and ceiling joists and use a pneumatic nail gun to save time and avoid the possibility of damage resulting from missed hammer blows.